Portable mobile sound card, perfect for Karaoke, singing, recording, DJ MC, live APP performance etc. Adopts for the DSP technology (digital signal processing) offers you HiFi sound quality & low noise sound. 8 sound effects: KTV, Studio, Concert Hall, Original Voice, Monster Voice, Baby Voice, Concert and Environment Monitor. 2 voice modes transform switch for beautiful or original voice. Compatible with most audio devices, such as headset, tablet, mic, instrument, smartphone, MP3/MP4 player etc. With ports for mobile phone, accompaniment, headphone and mic, micro USB port for charging. Comes with charging cable, 2in1 converter, USA transfer adapter, 2 * audio cables. The mobile phone, mic and earphone showed in the picture are not included. Adopts for the DSP technology (digital signal processing). 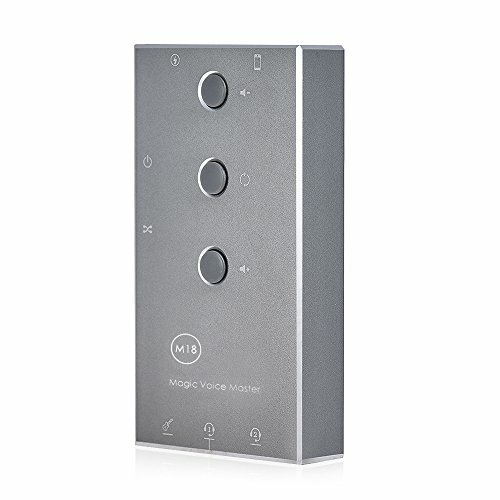 8 sound effects, 2 voice modes transform switch.